Published February 25, 2014 at 446 × 260 in iN11Native_Time_EPK_Photo_Mountain. 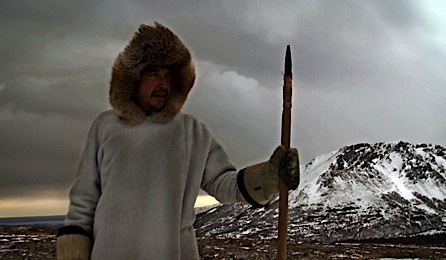 In this clash of cultures, an Inuit hunter from an older age scours the barren landscape in search of food, but an unexpected turn takes him into a strange world where time has a different meaning. Cup’luaq, a.k.a. Jack Dalton (Yup’ik), is an Anchorage-based filmmaker and visual artist rooted in theatre. He was honoured by the World Indigenous Peoples’ Conference on Education as a Distinguished Dignitary and chosen as one of Alaska’s Top 40 Under 40.